daughters Marian and June and nephew Hugh Philip. Humans instinctively want to protect what they love. 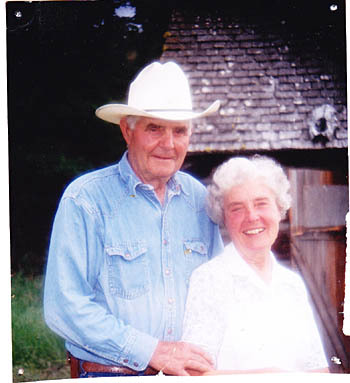 Connie Philip made a promise to herself,because of her love for Warner, to set aside part of the ranch to honour his memory. 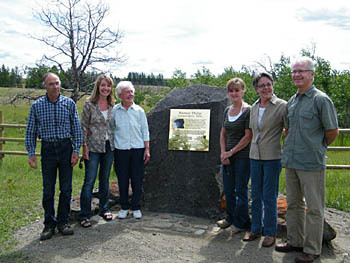 In June 2011 that promise was fulfilled with the establishment of the Warner Philip Conservation Area. 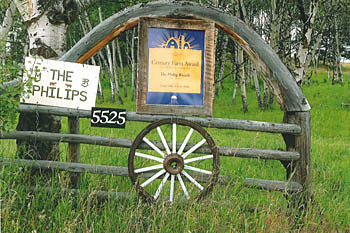 The Philip ranch, at Long Lake, near Knutsford, B.C., was settled in 1909, making it one of the oldest family ranches in the province. The 640 acres (260 ha) of the Warner Philip Conservation Area includes the original quarter section they homesteaded. Here Warner Philip grew up, here he and Connie raised their family, promoted the beef industry and coped with its challenges. Warner Philip died in 2005, but Connie remembered her promise. Warner knew the land and loved it for its natural plant and animal life as well as its agricultural values. It’s that double heritage that Connie Philip was determined to preserve in his memory. Connie and her son Peter still run the ranch. They wanted a way to protect the land, while continuing to use it for cattle. Connie and Peter decided the Nature Conservancy might offer a solution for their land. 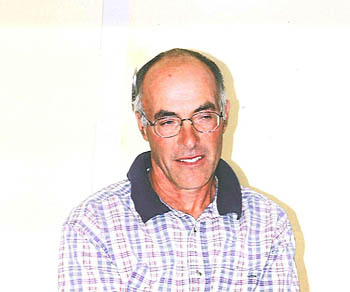 "We didn't want it to prove an obstacle to Peter's ranching." Connie says. "If we set it aside as a park, then it would be open to the public." They decided on a conservation covenant. The covenant means that title hasn’t changed. Philips retain title. The Conservation Area is an active part of the working ranch. However, should it ever be sold, it must be sold as a block and the conservation covenant will still apply. The land cannot be subdivided and must be managed for natural as well as agricultural features. The natural values here are very important indeed. They include wetlands, middle and upper grasslands, Douglas fir copses, and ponderosa pine woodlands. The area forms part of the key locality in British Columbia for migratory birds. Sandhill cranes depend on Philips grasslands and ponds for rest and refreshment during their spring and fall migrations. The native grasslands form only one percent of B.C.’s natural environment, but they provide habitat for a great diversity of plants and animals. “Warner, “ Connie recalls, “was very observant of the land. He could spot new flowers showing by the side of the road, even when driving by! He was always the first to report the first ones coming through in the spring. Lady’s slipper, shooting star, violets, lupine, chocolate lilies grow on the ranch. So do wild raspberries, chokecherries and Saskatoons.” Those wild berries made tasty desserts for early settlers. Moose, black bear, deer, coyote and porcupine roam the ranch. A variety of butterflies and moths flutter across it. The fact that the covenant exists in perpetuity is an advantage for both the Philips and the Nature Conservancy. Peter sums it up, “You don’t make a deal with one group of people and they leave then you find you’re dealing with another group. “ All the ranch land is included in the ALR. Warner was an advisor for the ALR. Gate to the ranch house. 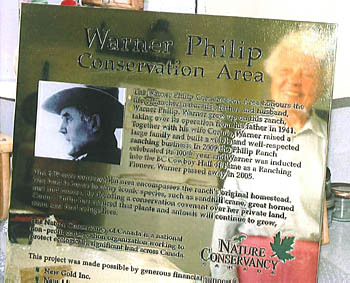 It took approximately three years from the original proposal to dedication of the Warner Philip Conservation Area, because the NCC insists on having funding in place for both short and long term management. “There are costs, whether by purchase, covenant or land donation. There are legal costs, administrative costs and operational costs. We need to have stewardship funds in place, to have a specific endowment so we can look after that property in perpetuity.” Barb explains. It took three years to raise funds for the Philip property. Barb continues : “We always go with the landowner and look before we make a commitment. What species are there? Are they healthy? Are there stewardship issues; ie weeds? Will there be restoration problems?” The NCC always does a baseline inventory and survey of plants and animals on the property. 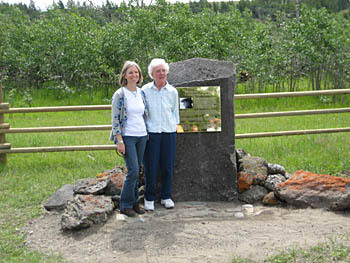 Barb Pryce and Connie Philip by the memorial plaque. Generations to come will thank them.